On 19th June, along with 12 other members of the Manx Folk Dance Society (MFDS) (the youngest just 2 years old), I flew to London Gatwick, where after about a 4 hour wait, we flew to Copenhagen, where we caught the train over the Öresund Bridge to Malmö. We were welcomed into Copenhagen & Malmö by a tremendous thunderstorm, with thunder and lightning! 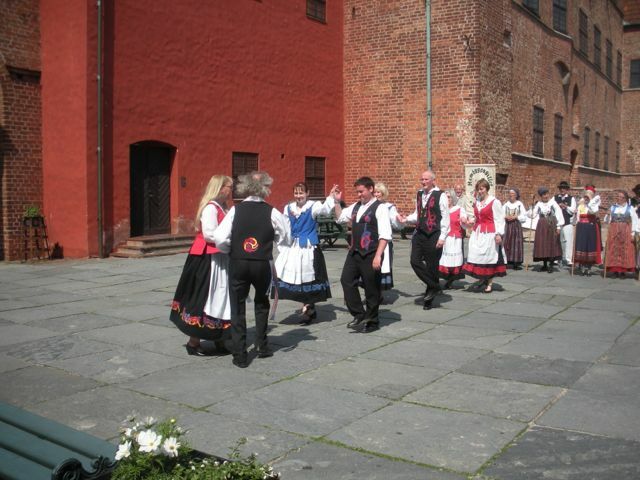 Having been met by the local folk dance group, Hembygdsgillet and 4 more of MFDS, we were walked round to a small hall, while our luggage went by “Movebybike. 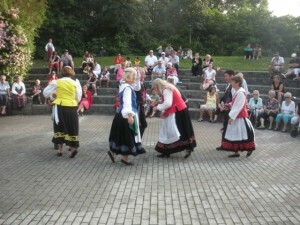 There we were fed and then did some sharing of our folk dances. It was very warm at 24°C. 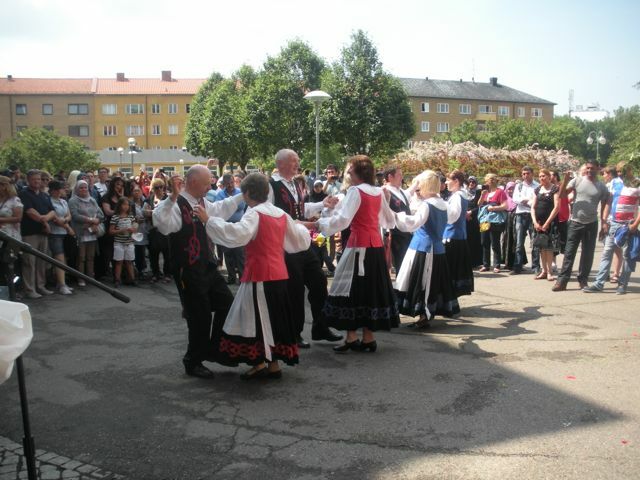 The next day we performed at an international school for “recent arrivals”, Södervärnskolan, where they are taught Swedish and something about the way of life and traditions. They had set up and decorated a small “mid-summer pole” and we tried to dance in the shade next to it – to get out of the 28°C temperature! 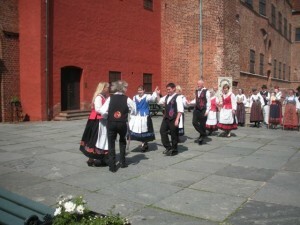 After some refreshment we moved on to the Malmö Museum for a delicious lunch in the Vega Restaurant, followed by more dancing. Then at 4pm we were given a tour of the castle/museum with an English-speaking guide. 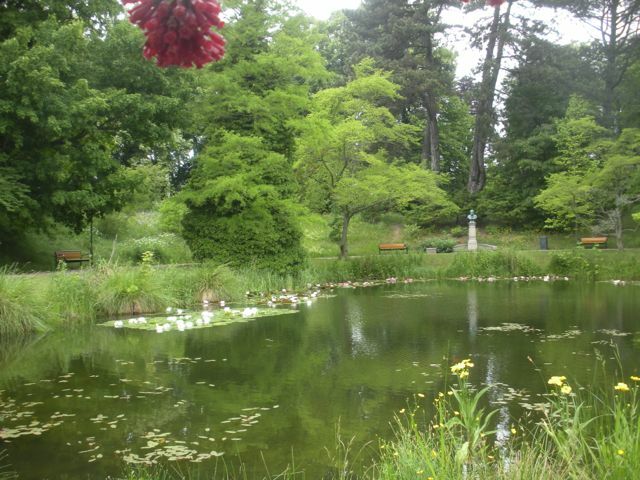 It was the history of Malmö interlinked with the history of the castle as the 2 couldn’t really be separated. 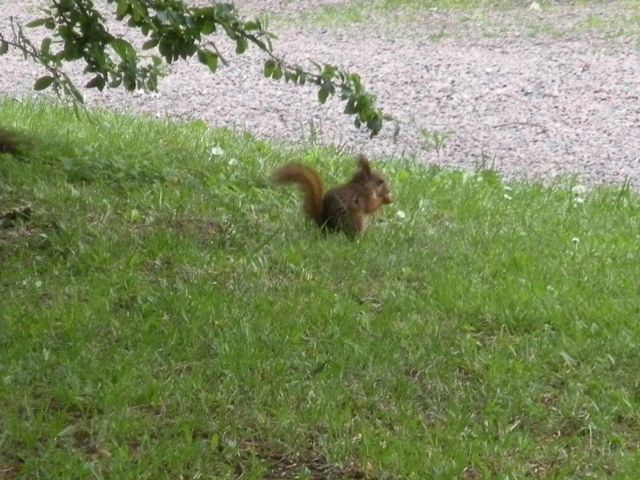 We then drove on to Lindängen, a park with a small amphitheatre, where we performed after the Junior sections of Hembygdsgillet. 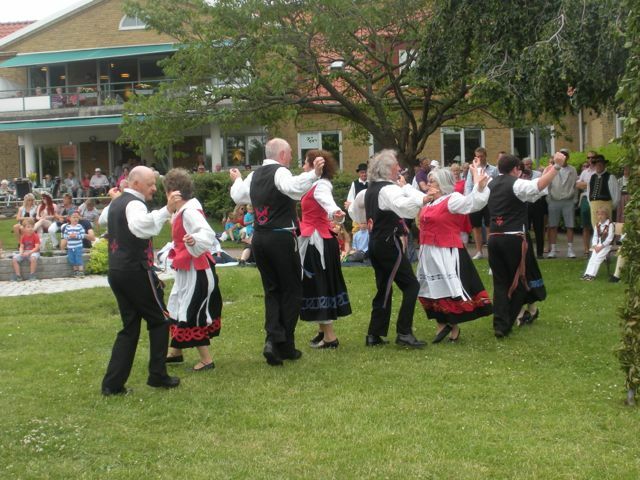 On Friday, 21st June, which was mid-summer eve, we were taken to Tygelsjö, to dance in a grassy, garden area at an old people’s complex. 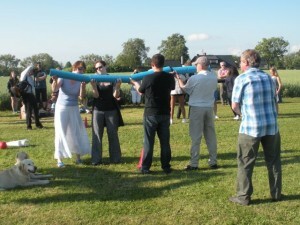 A mid-summer pole was erected and lots of families came along, many with picnics to see the festivities. We performed our dances in the grassed garden area followed by Hembygdsgillet’s juniors & teenagers. 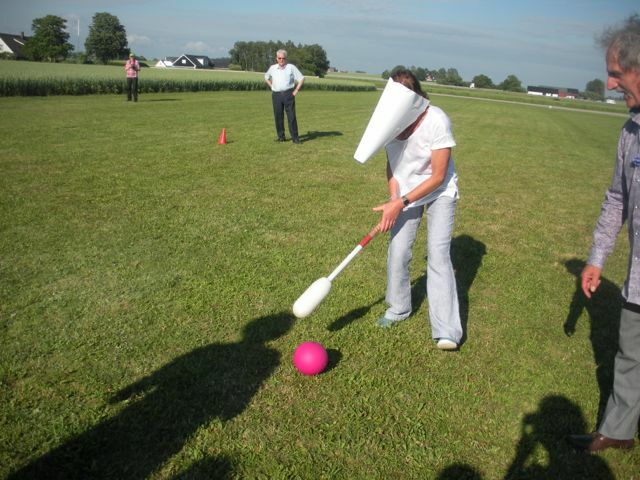 After that, there was general dancing and games with the children in mind. 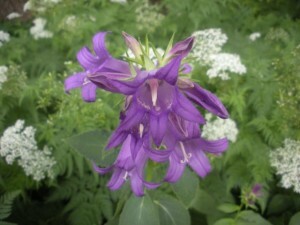 The temperature was about 29°C. 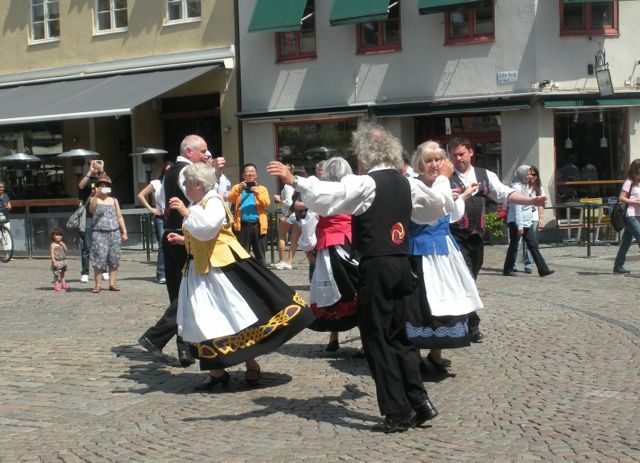 Then we moved on to the Lilla Torg (Little Square) where we followed on after Hembygdsgillet, to dance on the cobbled street. Then their teenagers performed a modern dance, with an Irish influence. 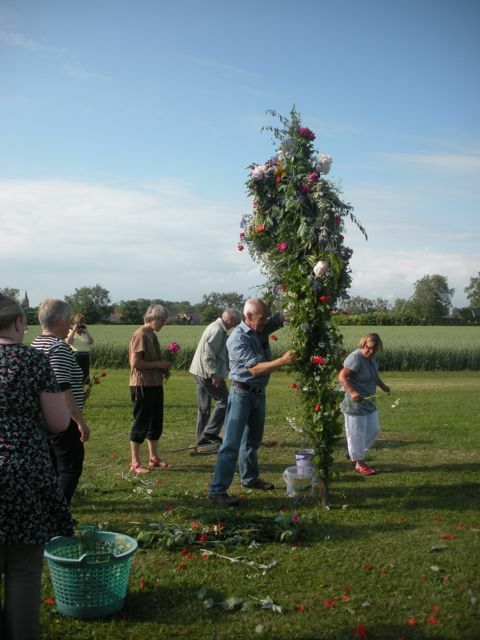 That evening, in beautiful weather, we gathered at Banstorp, the farmstead of one of the Swedish group, where a mid-summer pole was decorated with greenery cut from the garden and a mass of flowers, which the members had either gathered from the wild or picked from their gardens. 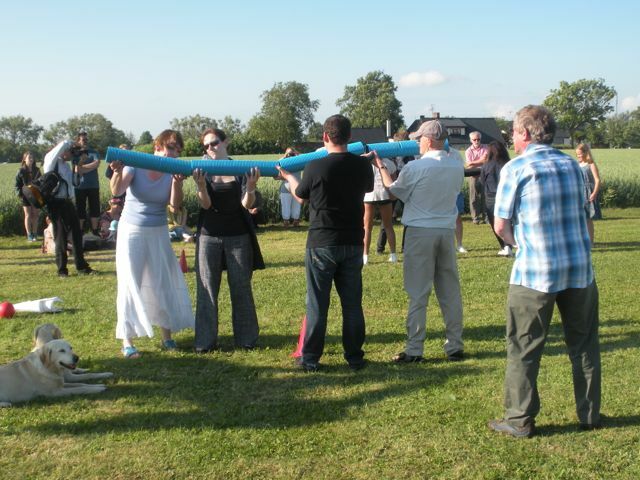 It turned out to be a spectacularly colourful pole which was eventually raised and anchored in the ground. More dancing and singing took place around the pole. Then some silly team games – IOM v Malmö! which ended in a draw. 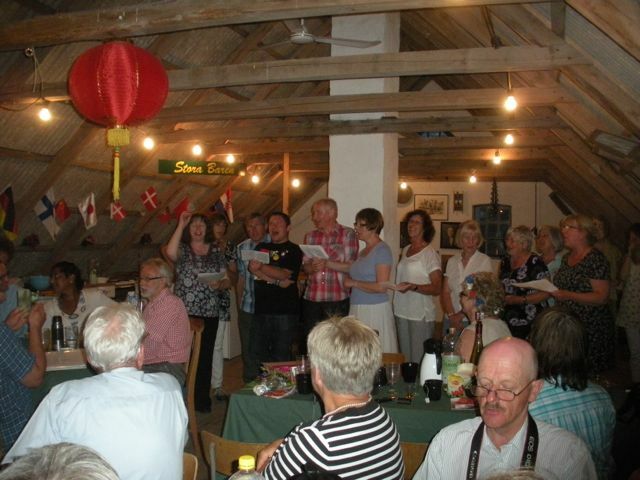 Afterwards everyone adjourned to the barn for a wonderful supper of pickled herring, boiled potatoes and meatballs with sour cream & chives – delicious! This was followed by fresh strawberries with milk! Then there was a lot of singing, music playing and drinking! A fabulous mid-summer eve! 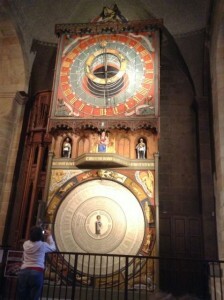 On Mid-summer Day we were taken to the nearby town of Lund to see their magnificent calendar clock within the Cathedral. We heard and saw it chime midday, with sword fighting knights on horseback and a nativity type tableau with the 3 Kings acknowledging the baby Christ. Then we were given a guided tour, in English, by a delightful lady, with a true love of the Cathedral and its history. We went to the Botanical Gardens after that for a picnic lunch. It is laid out in areas – some quite formal with many types of cultivated plants and other areas where nature has been allowed to take over. 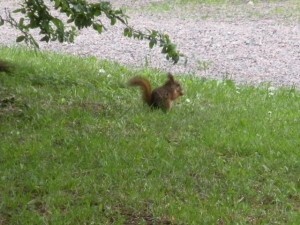 As we were leaving we were fascinated to watch a couple of red squirrels playing amongst the bushes. After a quick visit back to the homes of our hosts, we went to Bara, to the home of one of their musician for a barbecue and social evening. 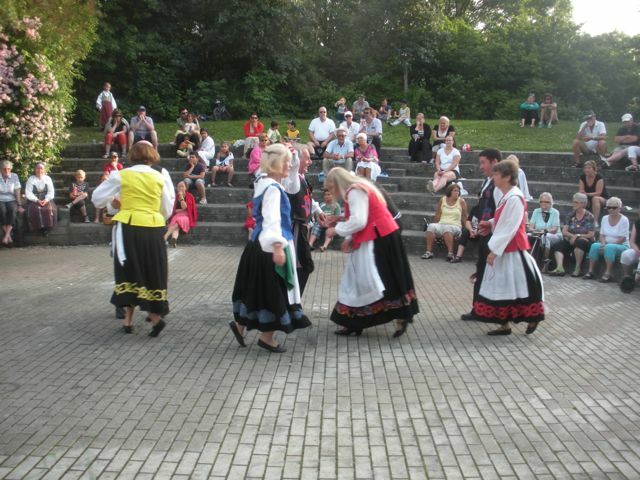 After the food and some drink, we went into the Park nearby where there just happened to be a wooden platform area, where we could dance together in the glorious evening sunshine! Our youngest member stole a place in everyone’s hearts when he ‘performed’ his own solo dance to his audience! 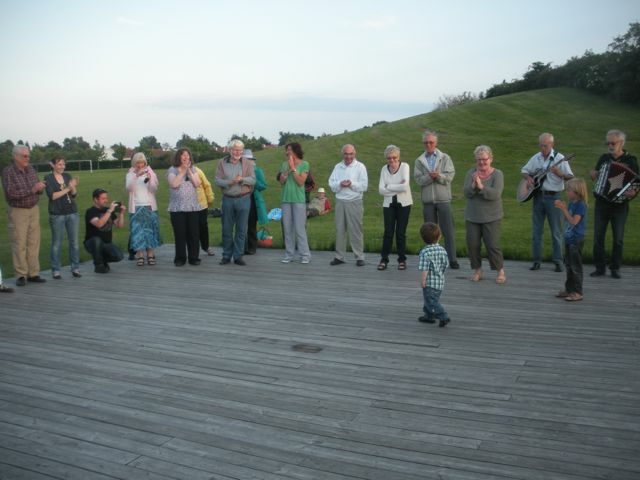 He adores dancing and was up taking part in as much as he could – it helps if your mum & dad are both dancers! Eventually it was time to go back home and pack ready for our early departure the next morning. We thanked the local Hembygsdgillet group for their hospitality and left them a small thank you gift. We also said a big ‘thank you’ (with a small gift each) to their Musicians for helping us out by playing for us to dance, as well as showing our appreciation to our own members who had ‘pulled out all the stops’ to practice our dance tunes’ on their instruments so that they could also help out – when they were not dancing! Well done to all of them – they really had worked hard! We were at the Hyllie Railway Station by 7.30am on Sunday morning – in the rain, to say goodbye to our friends and hosts before catching the 8am train back to Copenhagen for our flights home. We felt very privileged to have been invited to share the annual Mid-summer Celebrations with our dancing friends in Malmö. Following the visit by Tipyn O Bopeth to the MFDS 60th Anniversary Festival of Folk Dancing in August 2011, on Friday 3rd May 2013, 13 members of the Manx Folk Dance Society travelled to Carmarthen to visit Tipyn O Bopeth. The Welsh Group Leader hosted 6, with others staying at the Boar’s Head, staying at a farmhouse or using their campervan on a campsite. 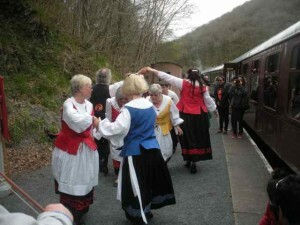 That evening both groups met in the Function Room of the Boar’s Head for social dancing and getting re-acquainted. 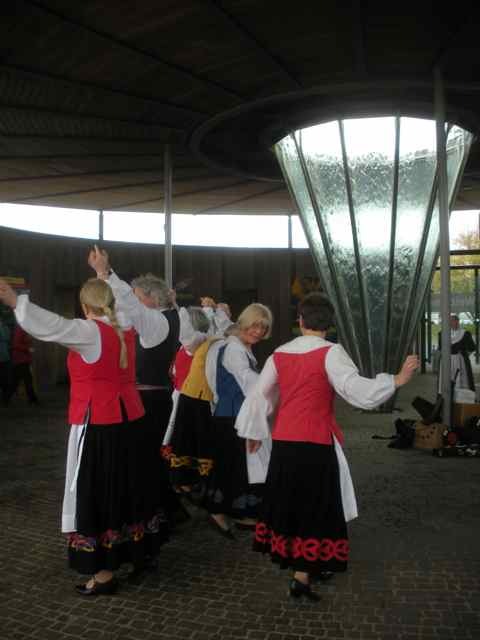 On Saturday 4th May MFDS met up with some other Welsh Folk Dancers, a small group from the Garth Country Dancers and Sweyn’s Eye Morris Dancers at the National Botanic Garden of Wales, where they danced on and off for most of the day, as well a sharing some Welsh and Manx social dances. The weather was kind by being sunny, but the wind was cold. That evening there was a meal at the White Hart Thatched Inn & Brewery, Llanddarog. 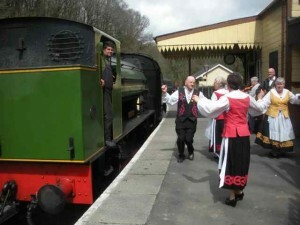 There was a relaxed start to Sunday 5th May, then a drive to the Gwili Railway to catch the 1.20pm steam train. Again the weather was fine, and there was the chance for another picnic lunch and some dancing on the Stations’ Platforms. In the evening there was a BBQ at a Dutch friend’s house just outside Carmarthen. 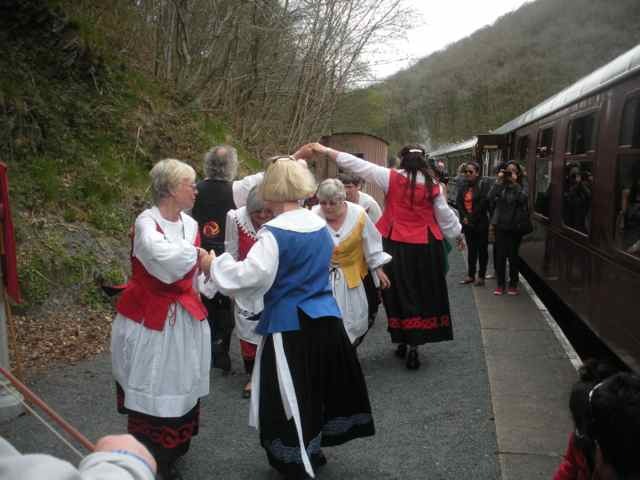 There was an early start on Monday 6th May with a long minibus drive to Llangadfan, a small village where some of the old traditional Welsh dances are from, where they joined other members of the Welsh Folk Dance Society at a small Festival. 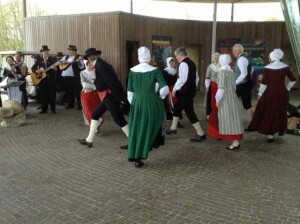 A group of Breton dancers & musicians from St.Brieg were also there. 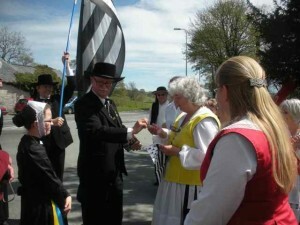 This was a very informal event in the Car Park of the Cann Office Hotel, with a lot of social, join-in dances. A small exchange of gifts took place between the Manx & Bretons. Then everyone partook of an excellent carvery meal at the Inn. 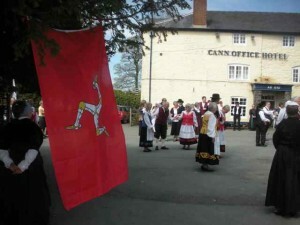 In the evening the Manx Dancers took their Hosts for a meal at the Falcon Hotel in Carmarthen. Most of the Manx Dancers & Musicians went home on Tuesday 7th May, tired but happy after a wonderful dancing weekend with friends. 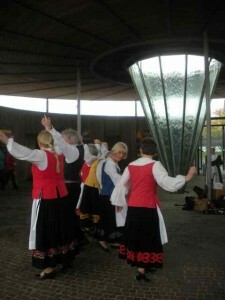 It is hoped that the Welsh dancers will come over to the Island again some time in the future.